Home / Posts Tagged "Northern Spinning and Weaving Company"
Wesley Watson was born in Co Armagh in 1852, coming from a family with wide ranging interests in linen bleaching and manufacture. 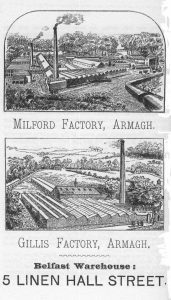 In 1886, he entered into partnership with William Mercer and Robert McCrum, to form a linen manufacturing firm styled as McCrum, Watson & Mercer: the company being based in Milford, Co Armagh. It was formerly known as Messrs Robert McCrum & Co, as it was his father, William, who built the village of Milford to accommodate the workers of the mill that had been established in 1808. It produced high quality linen damask, napkins, towels and sheeting. The company was immensely successful from its inception having been credited as being the first in Ireland to use the dry spinning system using water power. The founder’s son Robert Garmany McCrum (1829-1915) built Milford House, a magnificent Italianate mansion on the outskirts of the village, and appears to have been the partner most involved in the day to day running of the business. In 1894, McCrum, Watson and Mercer became a limited liability company with members of the management (including Watson) becoming shareholders. The company also owned a linen warehouse at 5 Linenhall Street in Belfast (now occupied by Lancashire House – erected 1959) and another linen factory at Gillis in Armagh. 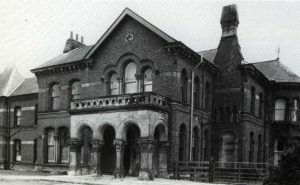 In 1887, following a severe depression in the linen industry in north east Ireland, one of the largest concerns of its type in Belfast, the Northern Spinning and Weaving Company was forced into liquidation with the Managing Director, Thomas Valentine being obliged to sell the mansion house he had built in 1863 known as “The Moat” in order to liquidate his assets. Wesley Watson purchased the property from Valentine, and he and his wife took up residence shortly afterwards, having previously lived at Hannahville, Greenisland, Co Antrim. However, George Washington Wesley Watson’s first wife, Margaret Maria, died on 22 March 1894 (at The Moat, left), and three years later he re-married, this time to his cousin, Eliza G Watson, of East 34th Street, New York, daughter of William Watson, a successful dry goods merchant of West Farms, Westchester County, New York. William had emigrated to America earlier in the century. Eliza, born in 1851, came from a large family, having 4 brothers and 4 sisters. 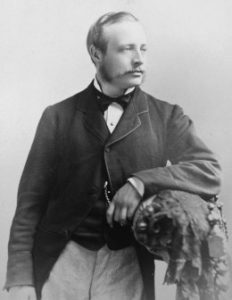 Although Eliza’s father, William Watson died in 1877; the family remained in the homestead, Willmount, until the death of their mother, Maria, in 1894. Part of the Watson estate property in the Bronx, lying north of Westchester Avenue and extending from the Bronx river to Clason’s Point Road – a tract of more than 93 acres (equivalent to about 1,200 city lots) – was sold in 1909 to the American Real Estate Company for $1,500,000. The Watson estate, with the adjoining estates of the Astors and the Trasks, constituted the largest land area entirely without development in the Bronx. The sale marked the passing of one of the great estates of New York. Wesley and Eliza’s engagement and wedding were well documented in the Society columns of the New York Times. The service was held at the Protestant Episcopal Church of the Incarnation, Madison Avenue, and 35th Street, New York, on 5 January 1897. “A pretty house wedding was that of Miss Eliza G Watson, daughter of William Watson, to her cousin, G W Wesley Watson of Belfast, Ireland, at the residence of Miss Watson’s sister, Mrs William H Tailer, at 14 East 72nd Street, yesterday afternoon. The house was decorated with orchids, palms, potted plants, and crushed baskets of roses. 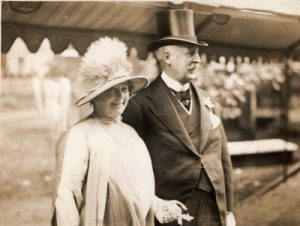 The bride was given away by her brother, Francis A Watson. She was attired in a becoming gown of rich white satin, the corsage being tastefully trimmed with old point lace. Her veil was of rare point lace, the gift of her brother, Francis A Watson. She wore several diamond ornaments, the gifts of the bridegroom, in her coiffure and corsage. Miss Antoinette Walton Martin gave yesterday afternoon in her apartment in the Cambridge a reception in honour of Mrs Wesley Watson of London (Miss Eliza Watson of New York). Mrs Watson received with Miss Martin. There were some 200 guests present. Mr & Mrs Wesley Watson arrived here about a fortnight ago on their annual visit to New York, and will sail for England on Nov 27. Their stay here this Autumn is more brief than usual. They will spend the Winter on the Riviera. As a result of his marriage to Eliza in 1897, Wesley spent most of his time in London, where they resided in a large house at 14 Cadogan Gardens in fashionable Chelsea; and in New York where they crossed the Atlantic in first class luxury aboard the latest Cunard Liner each Autumn. They only stayed at The Moat on their brief visits to Ireland. It would appear that following his good fortune in marrying his cousin, Wesley Watson retired from having any active part in the business, although he continued to be a director and the company retained his name as an original partner. .No-one knows the extent of her gifts – many of them were given anonymously – but she is estimated to have spent £10,000 a year for charity. Amongst the charities she helped were Great Ormond Street Hospital, the Victoria Hospital for Children, Tite-street, Chelsea and the Queen Charlotte Hospital. Subsequently, when Wesley visited Belfast following the sale of The Moat, he stayed at The Ulster Club at Castle Place. 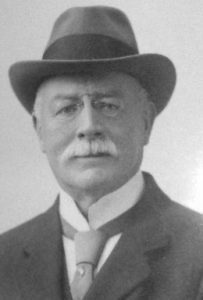 Wesley Watson died in London in 1929 aged 77. Eliza survived him by 7 years (aged 87). Her memorial service was held at Holy Trinity Church, Chelsea on Wednesday 15 July 1936. McCrum, Watson, Mercer passed from Robert McCrum to his son, William, but he had little interest in the business and by 1930, the company was in the ownership of the Northern Bank, and run by a team of managers. During his lifetime, Wesley remained in contact with the family in Ireland and in particular, Marjorie Smyth. On his death, he left Marjorie a trust legacy of £3000 from which she was to receive an income for life. A sum of 5% war stock was allocated from Wesley Watson’s estate to meet this legacy and which would produce an annual income of £150. 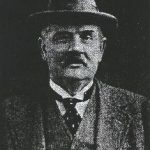 Captain Watson & Mr Stuart E. Smyth were trustees.